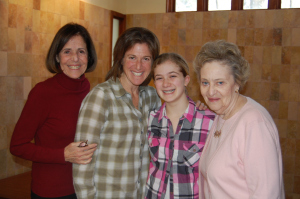 A few weeks ago, Diane Black, one of our board members and a Mikveh Guide, brought her daughter Rebecca and her granddaughter Jessica to Mayyim Hayyim to celebrate Jessica becoming a Bat Mitzvah. Diane guided Jessica, and Rebecca witnessed. Diane, Rebecca, and Jessica were interviewed, and did not see each other’s responses to the interview questions. It is remarkable that their experiences and feelings flowed so well into one beautiful story. Diane: Guiding a granddaughter is a concrete measure of the passage of time. I love this journey they call life, but this was a moment when I saw before my eyes how fast this journey is actually going. Was this the daughter of my daughter? How is that even possible? Rebecca: My involvement at Mayyim Hayyim has been through my mother. I have watched her embrace the mikveh and its offerings. I have seen her face light up when she talks about a recent convert that she guided, and I have met the amazing women who work and volunteer there. The genuineness of the place and the people involved always make me feel good. Jessica: I wanted to do my Bat Mitzvah project at Mayyim Hayyim because my Nana brought me to the annual fundraiser, and I felt connected to the stories that were shared there. My project involved creating acknowledgement cards for B’nai Mitzvah students, who immersed at Mayyim Hayyim. I will also give a tour to my friends and their parents to educate them about mikveh. Diane: I became involved with Mayyim Hayyim because the mission spoke clearly to me. I love that we are a place for all Jews, where they can bring both their religious AND secular issues. Jessica: My favorite moment of the day was when I was able to show my Grandma and Dad the significance of Mayyim Hayyim, by giving them a tour and showing them all the sacred parts of the mikveh. This moment gave me a lot of strength and courage. Rebecca: Witnessing Jessica’s immersion was more powerful than we had anticipated. Because we “knew” what the process involved and had been to the mikveh to drop things off many times, we thought an immersion to mark Jessica’s Bat Mitzvah would be a nice thing to do. Little did we realize that our tears would flow into the waters. Jessica: During my immersion, I felt so over-whelmed with different good emotions: I was so happy to be a Jew and continue with tradition, and I felt so loved by my Nana and Mom, who were in the room with me. When I looked at myself, I just felt so beautiful. Diane: I felt like God was actually there with us! Rebecca: Life moves at a pretty frenetic pace. When you add Bat Mitzvah planning, and extra curricula activities into an already busy day, it is sometimes hard to stop and reflect. Starting Jessica’s Bat Mitzvah weekend off with an immersion, helped us realign ourselves. We returned to calm, quiet and spiritual feelings. There was no pressure of time, nothing flashy, and nowhere to be but present with one another. I am hopeful that Jessica’s Jewish journey will continue with her knowing that the mikveh is there for her whenever she needs realignment. Jessica: I feel that Mayyim Hayyim has helped me grow because it has shown me the religious and special sides of becoming a Bat Mitzvah. This experience really helped me take a step back to remember and enjoy that I am a young Jewish woman. Mayyim Hayyim is such a powerful place because it helps visitors recognize the essence of beauty, peace, and calm in the waters. Jessica Friedman is thirteen years old and in the seventh grade at The Rashi School. After school, she likes to play sports, her favorite are basketball and lacrosse, and participate in the theater program. In the summer, she likes to sail and swim. Rebecca Friedman (nee Black) lives in Needham with her husband Michael and their four children. They moved to the Boston area three years ago to be closer to family, and have found a great community with wonderful opportunities for everyone. Diane Black has been a Mayyim Hayyim board member for seven years and a Mikveh Guide for two. Being around people makes her happy, and she loves to talk with and to cook for family and friends.